At the time that Jesus summoned him to follow Him, Matthew was a publican (tax-collector) for the Romans. His profession was hateful to the Jews because it reminded them of their subjection; the publican, also, was regarded by the pharisees as the typical sinner. 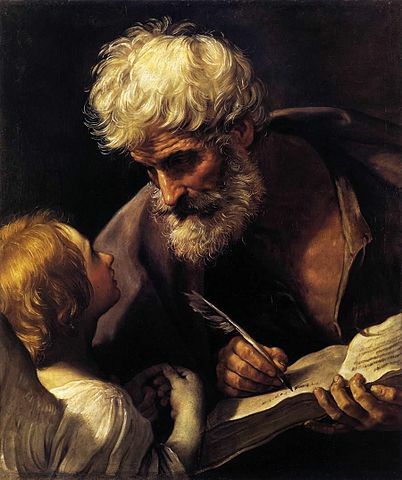 St. Matthew is known to us principally as an Evangelist and his gospel is the first book of the New Testament. No-one was more shunned by the Jews than a publican, who was a Jew working for the Roman enemy by robbing his own people and making a large personal profit. Publicans were not allowed to trade, eat, or even pray with others Jews. The Western church celebrates the feast of St. Matthew on 21 September, while it is celebrated on 16 November in the Eastern Rite. In the traditional symbolisation of the evangelists, based on Ezekiel 1:5–10 and Revelation 4:6–7, the image of the winged man is accorded to Matthew because his Gospel begins with the human genealogy of Christ. In art, Matthew is often depicted with an angel and a book. Take time to read St. Matthew's Gospel, keeping in mind that St. Matthew depicts the humanity of Christ and emphasises His physical sufferings. He makes frequent reference to the fulfilment of prophecies because he wrote to Jews and to Jewish Christians. Consider St. Matthew's call from Christ "Follow me" and how we are all called to belong to the family of God.